Hi everyone. I'm a new owner of a '98 base model with asc, and the dash indicator light comes on and stays on within the first mile or so of driving each time I start the car. Before this point, it does respond to the switch. Searching on here and bfc seems to indicate that the system usually malfunctions with the abs since they use the same wheel speed sensors. However, my abs is functioning properly. I've already disconnected and cleaned the electrical connectors at the asc cable motor along the right side of the engine bay and the asc intake valve. I also checked the relay for corrosion (though i have not checked any of these for function... Haven't had the chance yet, and can't find my multimeter). The cable is seated properly in the semi-sircular pully at the intake side. I know many people will suggest having the abs computer scanned, but I don't really have that cash to fork over when I'm not so sure it's gonna give any result, since the abs is functioning properly. I'm kind of at a loss, and would appreciate any help. Thanks! Additionally, I tried to check the relay by pushing the asc+t switch before moving the car (so the light had not come on yet), and there was no clicking actuation in the relay. However, I'm not entirely sure that hitting the switch should activate the relay, so I may not actually be testing anything *facepalm*. Can anyone clarify this? Thanks again! I took the secondary throttle body out of the engine bay today, and attempted to remove and check the secondary throttle position sensor. I was unable to get the sensor off because one of the attaching screws was so stinkin' locked up (and already stripped out), so I doused it in penetrating oil. I had to run an errand, so I went ahead and put it back in the car, and it seems to be working again, rather inexplicably. Hopefully, the problem won't resurface! If so, I'll bring it back to this thread. Carbon buildup most likely, I flush the throttle body with carb cleaner and lube at each oil change. Well, the problem is back... The ASC+t light's still coming on after a short period of time on the road, and the ABS still functions just fine with no warning light. I've tried playing around with everything again, and can't seem to find the problem. If I continue having trouble with it, I'm probably gonna go ahead and do the secondary throttle delete. There's no point in unnecessarily having added airflow resistance for a non-functioning stability control system. have you figured anything out with this issue? I'm looking at a car that has this light and the ABS light on and I'm wondering if this is a major issue to fix or an easy one. Thanks for you help. Sorry about taking so long to reply. I've just been swamped! I have good and bad news for you. The good news is that the problem you're experiencing is much more common than my problem, so there's a lot more information out there about how to deal with it. Though there's a lot of bad blood over there, check out bimmerforums.com. You can do a search for "asc abs" in the e36 forum, and should get a good selection of results. The bad news is that, from what I've read, it could be one a few things (though none are especially costly), and it takes a bit of work to figure out exactly what's going on. It could be something extremely simple, like a loose/poor connection at the asc actuator along the driver's side of the engine bay. It could also be one of the wheel speed sensors for the abs. If one of these stops working, it interferes with both the abs and the asc. Again, bf.c should be able to help you sort it out! Sorry for the quazi-convoluted answer, but I hope this will get you started in the right direction. Good luck with your purchase! Thanks for the response and info. 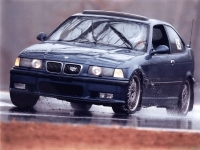 I am a member of the bimmerforums as I research issues on my 99 M3 convert. from time to time. I will check it out for the 318Ti issues. There is a mechanical error code associated also with the ASC+T light. You'll need an INPA interface to read the code. When this code occurs, the ASC+T light on the dash cannot be reset by the ASC switch. The light remains on as long as the code is detected. It can seem intermittent. The code is set when the cable link is tested by the system. Replacing the actuator (unless there is damage to it) generally won't fix the problem. Make sure your actuator rotates freely. Does the cable have slack in the end? If so, tighten up the cable end one or two turns to take up some cable slack. See if the code comes back. If it comes back, tighten the cable one or two turns more. See if the code comes back. In my case, the cable was just a little too loose and when the system tested the actuator, it did not feel enough resistance and assumed the cable was not operational. Don't over tighten it. I have a 97 that start giving same symtoms as above. ASC goes sometimes for many miles before light comes on. Restart car and its off again. I have a few ways to read codes , what exactly will read this error? It is my understanding that the codes can only be read and removed by the dealer. I have a couple OBD II readers and neither will read the codes. After replacing all the ABS sensors it was diagnosed that the control unit was faulty. You can not buy new anymore (according toy dealer) and I have not found anyone who will repair. I think the best option is a recycle (junk) yard. Personally I'm glad it doesn't function as it made it more difficult to get moving in deep snow and on hard pack (MN winters). Good luck. Sorry yet answer wasn't what you wanted. New development, it is off for good now. Thought it finally got fixed or resolved itself, now I realize holding button does not turn it on. I also notice light not turned on during startup. Looks like since buld was on almost all the time, bulb is out now. I really do want it to function during the winter, it helps a lot on slippery roads. If I want it off, can be turned off in a sec. Adjusting the actuator cable of the ASC butterfly is what fixed my problem. Thank You!! !